Not my photo of Jupiter, gang. It belongs to Tim at Across the Universe. Click the photo to see more. When I was a kid, I wanted to be an astronomer, the way Henry Hill wanted to be gangster. I grew up on Carl Sagan, and my Mom took me through a university’s introductory course in astronomy was I was 11. I still have the textbook around here: Jay M Pasachoff’s Contemporary Astronomy, 2nd edition. Much of it is out of date now, of course, but I can still thumb through it and remember how exciting it was to read and think about while I was up past bedtime, looking up at the clear Utah night sky. Anyway, I recently got a pair of Celestron 15×70 binoculars, and on those nights when the sky is clear, I’ve been turning them loose. 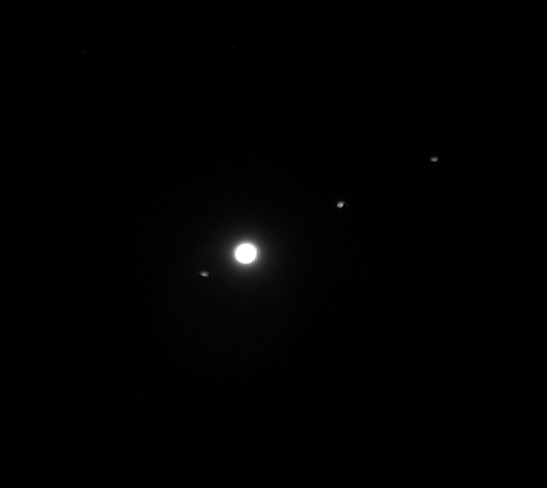 Just a few minutes ago, Jupiter and its moons (well…four of them, anyway) were the highlight. I also got a look at the Moon, which was shining through some low, thin clouds, and Mars, which had moved into view north of them. Saturn, sadly, was behind those low clouds, but I have insomnia, and Saturn isn’t disappearing. So that’s one way I occupy sleepless nights. What about you, fellow insomniacs?